Everyone met on time for our flight from London to Panama City via a short stop in Madrid. After a smooth flight we arrived early evening and transferred straight to our city hotel. We were up early for breakfast after which we set off in our coach through the city and within minutes were in an area of rain forest and the metropolitan park. We got out and started walking the trail, where we soon found a Red-crowned Woodpecker while a Green Shrike-Vireo could be heard calling. Nearby Andy found a Tiny Hawk, a rare bird for the park which we scoped alongside a Blue Dacnis. Three noisy Red-lored Amazons flew over and then a group of birds appeared that included excellent Crimson-backed Tanagers, Plain-coloured Tanagers, Social Flycatcher and a Southern Beardless Tyrannulet. In the same spot we got super views of Scrub Greenlet and another female Blue Dacnis, as well as Black-striped Sparrow, Common Tody-Flycatcher and White-shouldered Tanager. A Blue-crowned Motmot appeared on a fence post while a distant Scaled Pigeon sat on top of a dead tree and on a tall mechanical crane a Bat Falcon perched. A nice Red-legged Honeycreeper appeared and a flock of Brown Pelicans flew over proving we weren’t far from water. In the scrub we found a Blue-black Grosbeak and a Cocoa Woodcreeper, while a White-nosed Coati was our first mammal of the tour. As we moved on a Rosy Thrush-Tanager was heard but could not be persuaded to show itself. Walking along the forest trail we spotted a Two-toed Sloth and then a pair of Black-throated Trogons, which we were soon distracted from when Christine spotted a fantastic Common Potoo sat out on an open tree stump. A little further on was a Dusky Antbird and then a speciality of the area, two stunningly close White-bellied Antbirds. In the same area we kept getting brief views of a Lance-tailed Manakin, and a mixed flock held Black-bellied Wren, Red-throated Ant-Tanagers, a Red-crowned Ant-Tanager, Golden-fronted Greenlet, Fasciated Antshrike and Buff-breasted Wren. Then one of our top target birds was heard again – the Rosy Thrush-Tanager, and after some searching we got fabulous views of this gorgeous birds hopping about the leaf litter. A Squirrel Cuckoo appeared and more brief views were had of the Lance-tailed Manakin, before we moved on and found White-necked Puffbird, a superb close Double-toothed Kite and a couple of Plain Brown Woodcreepers. At an overlook we got fabulous views across the forest to the skyscrapers of Panama City, a very strange sight indeed. On a close flowering bush we found a female Violet-bellied Hummingbird, exceptionally good views of a Green Shrike-Vireo and a Dusky-capped Flycatcher. Leaving here we walked a narrow forest trail and soon found a Western Slaty-Antshrike and a Flammulated Attila (recently split from Bright-rumped Attila). A squeaky high pitched call drew our attention, not to a bird but to a couple of very smart looking Red-naped Tamarins. Another Double-toothed Kite was found just before the clouds appeared and the rain started. We left the forest and after calling in to the visitor’s centre we drove to an area of extensive mud flats, where we managed to find lots of Western Sandpipers, Semi-palmated Plovers, Semi-palmated Sandpiper, Willet, Short-billed Dowitchers, Whimbrel, Black-bellied Plovers, Yellow-crowned Night-Heron, White Ibis, Little Blue Heron, hundreds of Brown Pelicans and Neotropic Cormorants, Laughing Gulls, Magnificent Frigatebirds, Great Egrets, two Saffron Finches and some Grey-breasted Martins perched on telegraph wires. At a river bridge we spotted an Amazon Kingfisher, Wattled Jacana, Black-crowned Night-Herons and a Purple Gallinule before heading off for our lunch. After we had revitalised ourselves we drove to an area of marshland beside a rubbish dump. We were soon watching Ruddy-breasted Seedeaters, Smooth-billed Anis, Yellow-headed Caracara and some Black-bellied Whistling-Ducks. A lovely Pearl Kite sat on top of a dead tree, and then a Zone-tailed Hawk flew overhead before we found Barred Antshrike, Thick-billed Euphonia, Lesser Greenlet and Yellow Tyrannulet. Hundreds of Black Vultures were dying or dead from what we presumed was eating something poisonous from the rubbish tip. Further on we spotted a Straight-billed Woodcreeper, a Speckled Racer (snake) slithered past and we managed good views of Yellow-bellied Seedeater, Lesser Goldfinch and a Mangrove Warbler. Our last stop of the day was another marsh where a short walk produced a wealth of birds that included Southern Beardless Tyrannulet, Yellow-bellied Elaenia, Blue-black Grassquits, a huge Ringed Kingfisher and a very smart Pied Water Tyrant. We had to work to see a Pale-breasted Spinetail but eventually everyone got some sort of a view. Three Yellow-crowned Amazons were sat in a tree close to a Roadside Hawk, while in the distance we found a White-tailed Kite. Next on our list were a couple of Crimson-backed Tanagers, a Greater Ani and in a more open area Wattled Jacanas, Panama and Rusty-margined Flycatcher, a pair of Southern Lapwings, Fork-tailed Flycatcher, Roseate Spoonbill, two Savannah Hawks and a Cocoi Heron. What a great first day’s birding! This morning we had breakfast, then loaded the coach and set off to the small airfield that would see us catching a flight to the remote Darien National Park and our base at the Cana Field Station. We were soon on board our small plane flying along the coast then inland over miles of jungle to the small grass airstrip situated in what seemed like the middle of nowhere. Actually we were in the most remote part of Panama and at least a 2 day walk to the nearest Indian village. As we walked up to our lodgings which were of course basic but nevertheless comfortable, we spotted several Blue-chested Hummingbirds and our first Pacific Streaked Antwren. Once we had settled into our rooms we took a look around the grounds surrounding our lodge. Overlooking a bank we spotted a Little Cuckoo, Yellow-bellied Elaenia, Crimson-backed Tanager, Common Tody-Flycatcher and then on a dead tree which became a great place for a variety of birds to perch, we saw Pied Puffbird, Sooty-headed Tyrannulet, a Black-cheeked Woodpecker and Long-tailed Tyrant, while in the skies a distant King Vulture was seen as well as six Swallow-tailed Kites and a flock of thirty or more Plumbeous Kites. In another area of the grounds we got to grips with a superb White-headed Wren working its way through some tree vines, while a couple of noisy Red-and-green Macaws flew past. Stood in front of our accommodation, looking towards the vast expanse of forest we spotted Masked Tityras, Purple-throated Fruit-Crow, lots of Rusty-margined Flycatchers, Cinnamon Becard and Yellow-crowned Tyrannulet. Back on the big dead tree we watched a Cinnamon Woodpecker and a nice Cinereous Becard. It was time for lunch which was superbly served up by the camp crew. A short siesta was broken when David spotted the first of two Black-tipped Cotingas standing out so bright white against the curtain of green. We got ourselves ready and set off for a walk along the Mine Trail. A White-breasted Wood-Wren was soon followed by a showy female Spotted Antbird, and then Sulphur-rumped Flycatcher and a Checker-throated Antwren. Further on we got fantastic close views of a White-flanked Antwren, and scope views of a perched Olivaceous Flatbill. Cocoa Woodcreepers were easily seen and a group of manakins included Golden-crowned and Golden Collared, while another Spotted Antbird and a huge Helicopter Damselfly preceded fleeting views of a Whistling Wren. 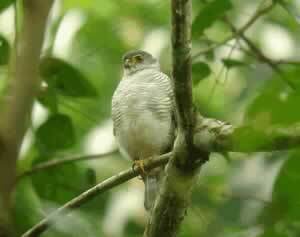 As we moved on a Tiny Hawk was seen perched above us and a small flock of birds included Slaty-winged Foliage-Gleaner, Black-chested Jays, Plain Xenops, White-whiskered Puffbird and another Olivaceous Flatbill. It then started to rain heavily so we hastily returned to the lodge and rested up. An hour or so later the rain stopped so we walked down to the airstrip and looked around. We saw several gorgeous Blue-and-yellow Macaws and a pair of Chestnut-fronted Macaws, while small groups of Blue-headed Parrots flew over as did a lone Lineated Woodpecker. We then heard the distinctive call of a Barred Puffbird but try as we may we just could not locate the bird which was sat motionless somewhere in the thick forest. Giving up for now we set about seeing a Jet Antbird with which we were successful and finally a couple of Brown -headed Parrots. Our evening dinner in this remote part of Panama was a true delight and praise must go to the cooks who produced such surprisingly good meals. An early morning breakfast saw us in the grounds looking at Green Thorntail, male Violet-bellied and Rufous-tailed Hummingbirds and a Bananaquit. As we watched, two Lineated Woodpeckers flew over. On the airfield a Yellow-tailed Oriole showed well, while a Barred Puffbird called but could not be seen. In the same area we found a superb Olivaceous Piculet and a Little Cuckoo, and on a nearby track everyone caught up with Jet Antbird. A Long-tailed Tyrant typically perched high up and a singing Long-tailed Hermit was eventually scoped deep inside a bush. As we moved on our first Yellow-backed Tanagers were found, along with a One-coloured Becard, Rufous Mourner, Keel-billed Toucans, and several fly over Blue-and-yellow Macaws. In a dead tree top we got superb close views of a Chestnut-fronted Macaw before one of our target birds a Grey-cheeked Nunlet was found. Nearby were Dusky Antbird, Black-bellied Wren and the first of today’s Plumbeous Kites. Both Cinnamon and two Red-rumped Woodpeckers showed well, and we got reasonable views of the Darien race of Chestnut-backed Antbird, which shows white spots on its wing coverts. In a tall Cecropia tree a Three-toed Sloth was seen slowly climbing down. Four Collared Aracaris were then spotted before we came to an open area where another target species, a pair of Dusky-backed Jacamars were duly scoped for all to see. Moving on, just a few of the group got to see a Black-faced Antthrush which had run across the track between the group, but right beside us, literally six feet away we enjoyed fantastic views of a Stripe-cheeked Woodpecker which had no concern at all that we were even there! showed well but a Lemon-spectacled Tanager proved too quick for most of the group to get on. It was rather quiet but we still managed another Striped-cheeked Woodpecker, an Orange-billed Sparrow and a Whistling Wren. We returned to our temporary home and while some of the group opted for the hammocks the rest of us took a short walk down to the airstrip where we watched a group of Great Green Macaws, some White-thighed Swallows and unfortunately still only managed to hear and not see the Barred Puffbird. This morning we had a healthy breakfast and then as we prepared for the hike up to Pirre tented camp, some of the group stood by the flowering shrubs and watched White-necked Jacobin and Green Thorntail. Off we went and not far into the start of our 7 hour walk a Common Potoo was found posing very nicely on a dead branch. Further up we spotted several Bay-headed Tanagers, some gorgeous Golden-headed Manakins and then the distinctive high pitched call of a Sharpbill was heard. It was muddy and humid but we continued on seeing Crimson-crested Woodpecker and a male White-tailed Trogon which perched high above us. One of the mid elevation specialities, a group of noisy Yellow-green Grosbeaks was found, shortly followed by Spot-crowned Barbet, Long-tailed Woodcreeper and Speckled Tanager. Higher we climbed with ever growing excitement that we were going somewhere so remote that only the hardiest of birders would have gone before us, and the potential for rarely seen species became more apparent. A Green-crowned Woodnymph was found as was White-ruffed Manakin and Western Slaty-Antshrike, Whistling Wren and Keel-billed Toucan. We had reached about quarter of the way and climbed the steepest part of the trail, but this was now the point of no return for anyone who felt the hike might be too much. Four of our group decided to return with one of the lodge guides while the rest of us continued on. A Rufous Piha showed briefly and then a pair of Saffron-headed Parrots, a stunning eastern Darien rarity was seen very well and scoped. We rested a while and had our picnic lunch before moving ever onward and upward. A Northern Barred Woodcreeper was seen and yet another Sharpbill only heard high up in the canopy. As we progressed more Yellow-green Grosbeaks appeared as did a group of Spider Monkeys, Collared Trogon and some Mantled Howler Monkeys. Just before we reached the top some Speckled Tanagers and Slate-throated Redstarts were seen. With a great sigh of relief we had made it and the camp was all set up and our staff was busy cooking dinner. We soon found ourselves a tent and then sat down and relaxed with a cup of hot tea or coffee. Sooner or later we all made it to “the veranda,” a lookout that gave impressive views over the vast and very remote Darien National Park. A Plain Antvireo showed well and distant raptors included King Vulture and Barred Hawk. As we enjoyed the scenery a Blue Dacnis was found, then after some hydrating drinks we went for a short walk. A small flock was soon located and amongst it were Lineated Foliage-Gleaner, Rufous-rumped Antwren, Spotted Woodcreeper, Red-headed Barbet and two Crested Guans. Further on we encountered our first Pirre Bush-Tanagers, a showy Slaty-backed Nightingale-Thrush and a superb perched Tooth-billed Hummingbird. On a little further and higher a Collared Trogon put in an appearance along with Black-and-yellow Tanager, Tropical Parula and a White-throated Spadebill. A Rufous-breasted Antthrush was heard calling nearby so we all kept still and quiet as it was lured into view, crossing the track twice where we could all see it well. A couple of noisy Sooty-headed Wrens could only be seen by those in the front of our group before disappearing into the thick jungle. Walking back to camp a Western Slaty Antshrike posed nicely and luckily a couple of us got brief views of a Sharpbill which insisted on giving us all the run around as it called many times from high in the canopy. Our dinner was ready and was delicious, despite our basic setting. Afterwards a very short walk found us another Rufous-breasted Antthrush, as well as Chestnut-headed Brush-Finch and Scale-crested Pygmy-Tyrant. As dusk approached a Choco Screech-Owl started calling but it took a lot of work for some of the group to see it, and the two much larger and louder Spectacled Owls. So after a long tiring day we dove into our respective tents. Let the snoring begin! This morning we were all up early for breakfast, after which we set off on a walk through the rich forest to higher ground. In the dense cover an Ocellated Antbird showed briefly to a few while Greenish Pufflegs were soon to become a common sight and sound of the forest. A Russet-crowned Quail-Dove was heard calling but after a lengthy wait it was only glimpsed by Kev who saw it fly off. Continuing on we came across a small flock of birds that included endemic Pirre Bush-Tanagers and Green-naped Tanagers, plus Varied Solitaire, Spotted Tanagers, and Ochraceous Wren. As we returned from the highest point at 5300 feet we had a baby Beautiful Treerunner perched above our heads being fed by its parents. A lovely looking tree frog was also found before we headed back to camp. Almost back and another group of birds included a couple of Crested Guan, Plain Xenops, Russet Antshrikes and another vocal but invisible Sharpbill. After lunch, all packed and ready to descend we found a small flock around the camp which included Red-headed Barbets, Black-and Yellow Tanagers, Green Honeycreeper and Blue Dacnis. As we started our descent it began to rain and with very little to be seen or heard we concentrated on getting down as quickly and safely as we could. After arriving back and meeting up with the rest of our group we sat with a cool drink and listened to some of the things they had found, which included a Baird’s Tapir that walked across the track right in front of them, plus an assortment of good birds including Black-tailed Trogon, Grey-cheeked Nunlet, White-necked Jacobin, Green Thorntail, Blue-chested Hummingbird and Green Hermit. For those of us that had endured the hike, tonight felt like pure luxury. After our breakfast we took a walk on the mine trail. As we left the lodge we saw Chestnut-fronted Macaws and a Pacific Streaked Antwren. In a dark area of the trail we listened to a close Black-crowned Antpitta which never gave itself up from behind a small ridge. Back out onto the airstrip and we saw a couple of noisy Great Green Macaws and then to our delight we got scope views of the elusive Barred Puffbird. Into the forest and beside a stream crossing, we all eventually got excellent views of a Brownish Twistwing, this flycatcher showing how it got its name by flicking one of its wings high over its back - quite bizarre! Nearby a White-whiskered Puffbird was found and then near to where a Western Long-tailed Hermit sang from his lek, we worked hard to get views of a nice male Bare-crowned Antbird. A little further on two Streak-chested Antpittas were calling and with patience we eventually persuaded one of the birds to come close and show itself very well. Behind us a Little Tinamou called but failed to show, while above several Plumbeous Kites patrolled the skies. It started to rain so we made our way back to the lodge, took off our Wellington boots and relaxed in the hammocks, and drank a few beers and sodas. Distractions were inevitable and we saw a distant White Hawk perched in a dead tree, some Ruddy Pigeons flew past, and another tree held Collared Aracari, Black-chested Jays and a line of Blue-and-yellow Macaws. Behind our lodge the big dead tree played host to two Pied Puffbirds and then an immature Bi-coloured Hawk flew in and landed close by. After lunch we set off to check out the mine trail again. We soon found Bare-crowned and Dusky Antbirds together and then a close Red-naped Tamarin. Where the trail split we had excellent views of a pair of Bay Wrens and shortly afterwards a Brownish Twistwing gave us a great performance. A flock of birds got us all excited but before we could start going through them a group of three Great Curassows were spotted on the track in front of us where they gave stunning views. Back to the flock and we soon picked out several White-fronted Nunbirds, Sulphur-rumped Flycatcher, Plain Xenops, Rufous Motmot, Rusty-margined and Ruddy-tailed Flycatcher, Golden-collared Manakins and Dot-winged Antwren. Moving on to the river trail we came across a very noisy group of Red-throated Caracaras and further on a perched Long-tailed Tyrant. Two Violaceous Trogons were found as well as a nice male Black-tailed Trogon. A lot of activity around a single large flowering tree eventually produced one of our target birds, the Double-banded Greytail, with at least three birds present and one continually going back and forth with nesting material. Happy with this find we made our way towards the river where an Amazon Kingfisher was spotted along with a Dusky-backed Jacamar and in the skies we watched several Short-tailed Swifts. Our morning walk after breakfast was to the Boca trail. Beside the airfield several Blue-headed Parrots were seen perched, while a Rufous-breasted Hermit hovered over some tall grasses and Great Green Macaws flew overhead. A Little Cuckoo was found and a vocal White-throated Crake was enticed to run across a track where we all managed to see it. Next we spotted a couple of Red-naped Tamarins, and as we made our way into the forest a Black-tailed Flycatcher put in an appearance and we got very good views of a Semi-plumbeous Hawk which flew around and eventually settled on a tall dead tree top. Two Green Ibis then flew by and we got good views of a Brownish Twistwing, while Golden-hooded Tanagers and two Mealy Parrots were seen perched. A Crested Oropendola was heard and then seen and as we went further into the forest we came across Rufous Mourner, Fasciated Antshrike and Long-tailed Tyrant. A small flock appeared and we soon sorted out Black-striped Woodcreeper, Purple Honeycreeper, White-vented Euphonia and a female Viridian Dacnis. A White-whiskered Puffbird gave very close views and then we had stunning looks at three male Viridian Dacnis. Very pleased with this we continued back towards the lodge soon finding a very nice Crimson-bellied Woodpecker, a close Barred Puffbird and two Grey-necked Woodrails which ran across the track. Hearing a Fulvous-bellied Antpitta we made our way into a thicket where a few of the group got to see this skulky species. Another small flock appeared and this time held a male White-eared Conebill, Red-rumped Woodpecker, Cinnamon Becard and Yellow-backed Tanagers. After a short rest some of us went for a walk on the mine trail where a White Hawk showed well, as did two White-whiskered Puffbirds, several Slaty-winged Foliage Gleaners, Sulphur-rumped Flycatcher, Tawny-faced Gnatwren, Red-rumped Woodpecker, Lemon-spectacled Tanager and one of our star birds of the day a superb Tody Motmot. Once again very satisfied with our haul of birds we returned for lunch seeing Golden-crowned Spadebill, Sulphur-rumped Flycatcher, Rufous Motmot and Spotted Antbird along the way. After lunch and a bit later than we had planned, we caught our light aircraft and flew to Punto Patino. Once settled into our cabins we re-grouped for a late afternoon walk. Yellow-green Vireos were easily seen alongside several Thick-billed Euphonias, while above us flew Short-tailed Swifts and a lone Lesser Swallow-tailed Swift. As we slowly walked down towards the beach we added Collared Aracari, Orange-chinned Parakeets, Greater Anis, Lesser Kiskadee, Crimson-backed Tanager, Roadside Hawk, Black-chested Jay and a superb looking Orange-crowned Oriole. After breakfast we left Punta Patino Lodge and while some of us walked the track down to the beach the others went by tractor and trailer. Those walking got to see a few birds including a Squirrel Cuckoo, Crested Oropendolas and a White-throated Crake. From the beach while waiting for the boat to be loaded we saw a few Royal Terns and Brown Pelicans. Once aboard we set off and cruised across the bay where more Royal Terns were seen, and on a small island White Ibis, Tri-coloured Herons and Neotropic Cormorants were nesting. Entering the river we found several Roseate Spoonbills, a perched Osprey and several Whimbrel, plus a wonderful Bat Falcon which was spotted on a tree top. A Mangrove Black Hawk and a Green Kingfisher showed well, plus a Blue Dacnis at the top of a tree and two Ringed Kingfishes which flew past. After winding our way through miles of twisting and narrowing river we approached the Indian Mogue Village where we were to stay for the night. Another Mangrove Black Hawk was spotted and some of the group got brief views of a Green-and-rufous Kingfisher before it took flight and disappeared. We were met by half the village who were in traditional dress and as we were being welcomed some of us spotted a Crane Hawk flying past. We were then taken to our platformed thatched building where our tents had already been set up. We had a drink and then began a long walk into the nearby forest. As we set off, a Short-tailed Hawk and a Lineated Woodpecker were found and then we spotted a White-winged Becard which showed well plus a couple of noisy Red-throated Caracaras. Moving on we came across a Tawny-crowned Greenlet, but a real highlight was when we found an adult female Ornate Hawk-Eagle perched beside its nest in a tall tree. After excellent views of this bird we moved on and eventually arrived at our Harpy Eagle site. Unfortunately it began to rain and the eagle could not be found. A very nice (for some of us!) Green Vine Snake was watched coming down a tree and it was then decided to have our lunch, and would you believe it, half way through eating, one of the Indian guides found a perched immature Harpy Eagle. A scramble ensued and we needed to climb through the forest and up a hill. Once there we could see the huge eagle sat in the V of a large tree. Those in the group that got there first also managed to see the female Harpy Eagle fly in and drop a dead sloth for the young bird to eat. We stayed there for ages and enjoyed this magnificent bird before heading back to camp. It was a long hot hike back and some of the group did score with views of a Black Oropendola along the way. Christine and Kathy somehow managed to get a couple of horses to bring them back. Tired and worn out we all reached the village and enjoyed a cool shower before being entertained by the locals with some traditional dancing. I wouldn’t even dare to mention Kevin B who tried joining in. As the sun set we ended the day seeing a couple of Short-tailed Nighthawks flying around the camp. After an early breakfast and a sleepless night for some, we set off though the village to the river edge where our boat awaited. We then needed to wait a while for the river level to rise enough for us to get past the shallows and out to the deeper river. There were some good birds as we waited including excellent views of the near endemic Sapphire-throated Hummingbird and several Black Oropendolas. A dead tree also held Black-throated Mango and Violet-crowned Woodnymph, while above us flew Lesser Swallow-tailed and Short-tailed Swifts. The waters eventually rose and we said our farewells to this remote Indian village. As we slowly cruised along we came across a Bare-throated Tiger-Heron, Ringed, Amazon and Green Kingfishers, and on the tops of several dead tree tops we saw no less than four Bat Falcons. A couple of Blue Ground-Doves dashed across the river and into thick cover and the occasional Osprey was seen perched. As we left the narrow river and entered the calm waters of a huge bay, we started to see groups of Royal Terns, Brown Pelicans, Magnificent Frigatebirds, several Whimbrel and on a small island that we passed close to, we saw lots of White Ibis, Roseate Spoonbills, Neotropic Cormorants and a few Tri-coloured and Little Blue Herons. Entering another river we eventually arrived at a small dock where several Mangrove Swallows were seen and our coach awaited us. It was then a long drive to get to our next lodge. A few species such as Pearl Kite, American Kestrel, Fork-tailed Flycatcher and Red-breasted Blackbird were seen along the way and as we drove the last section of unmade road it began to rain causing our coach to become stuck. A couple of 4x4s then ferried us to our very pleasant lodge and its very hospitable hosts. After breakfast and seeing White-necked Jacobin on the feeders we set off for a walk into the nearby forest. Amazingly one of the first birds we came across was a superb Plumbeous Hawk that showed exceedingly well. On the forest track a Great Tinamou was spotted, and then a group of six Brown-hooded Parrots posed very nicely, with several Mealy Parrots nearby for comparison. Green Hermits zipped past and in one area of forest we all got excellent views of two Song Wrens. A small group of Tawny-crested Tanagers moved through along with Tawny-capped Euphonia and a Lineated Foliage Gleaner. We also got good views of the local race of Chestnut-backed Antbird which has no spots on its wings. Down near a stream a pair of Spot-crowned Antvireos put on a fantastic performance just a few feet away, and out on the roadside we saw a pair of Shining Honeycreepers, while a couple of Swallow-tailed Kites flew over. Taking the road back towards the lodge two Rufous Mourners were found and we got superb views of a White-vented Euphonia. We decided we would spend some time around a fruiting tree and built up a good list of birds including Short-billed Pigeons, half a dozen Scarlet-thighed Dacnis, Blue Dacnis, Paultry Tyrannulet, Shining Honeycreeper, Green Honeycreeper, Emerald, Golden-headed and a single Rufous-winged Tanager. Back at the lodge we had a little break and after lunch watched the feeders seeing White-necked Jacobin, Sapphire-throated Hummingbird, Long-tailed Hermit, Red-footed Plumeleteer and Violet-crowned Woodnymph. We then took a rest before heading out on a different trail. Tropical Pewee was followed by distant views of Bat Falcon, we heard a Brownish Twistwing, saw Dot-winged Antwren, Red-footed Plumleteer and a perched White Hawk. Just myself and Dave saw a White-tipped Sicklebill hover just a few feet in front of us before completely disappearing. Further into the forest we saw Checker-throated Antwren and half the group got to see a Broad-billed Sapayoa. Excellent views were then had of Spotted and Plain-brown Woodcreeper before we headed back to the lodge. After breakfast we set off for a walk on a different trail which turned out to be remarkably quiet with long walks and seeing and hearing almost nothing at all. 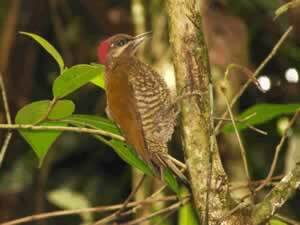 Several gorgeous male Red-capped Manikins showed well and a Purple-crowned Fairy hovered over our heads. A small group of Tawny-crested Tanagers allowed a few of the group to catch up with this species, while a Stripe-throated Hermit and Golden-crowned Spadebill were also seen. We just missed out on a Tawny-faced Quail and only got a couple of tiny frogs and a Dot-winged Antwren before returning to a small stream where a noisy commotion led us to an Army Ant swarm. Bi-coloured Antbirds could be heard and seen briefly, and then an Ocellated Antbird called. We waited but they failed to appear so we went along the stream edge to get closer. We were soon in amongst the action seeing the Bi-coloureds plus up to five Ocellated Antbirds, Plain-brown Woodcreeper, White-whiskered Puffbird, a Buff-throated Foliage Gleaner and a pair of Stripe-throated Wrens which were found in a thick tangle high in a tree top. Before leaving we found a Golden-crowned Spadebill, and got even closer views of the antbirds. We returned to the lodge and packed our luggage. After lunch we boarded the coach and set off to a lake where we took a short walk in the adjacent forest. A Wood Stork flew over and as we entered the wood a Yellow Tyrannulet and Scaly-breasted Hummingbird showed well before we found our target bird with two Black Antshrikes. Excellent views were had of this rare species before we spotted a male Barred Antshrike and then headed back to the coach. A fruiting tree beside the coach held a bunch of birds including Thick-billed Seedfinch, Orange-crowned Oriole, Bananaquit, Blue Dacnis and Yellow-bellied Seedeater. Looking out over the lake again we spotted two Cocoi Herons and an Anhinga. As we drove to Cerro Azul we made a few roadside sightings included White-tailed Hawk, Pearl Kite, American Kestrel, Crested Caracara, Yellow-headed Caracara and a group of Great Egrets. As we arrived at our lodge it began to rain and even became torrential. After breakfast we took a walk along the roadside where we found a confiding Rufous-capped Warbler and a Yellow Tyrannulet. Further up the road we found Lesser Elaenia, Buff-throated Saltator, two Barred Antshrikes, and we heard an Immaculate Antbird. In the surrounding bushes a couple of White-lined Tanagers appeared as well as Golden-hooded and Crimson-backed Tanagers. Yellow-bellied and Lesser Elaenia were seen in the same tree allowing good comparisons and further searching revealed Streaked Saltator, Yellow-bellied Seedeater, a tree full of Scaled Pigeons and several fly over Chestnut-headed Oropendolas. Returning to the coach we drove to a higher altitude passing a bridge which held a Black Phoebe. Following a narrow trail into the forest we came across a White-whiskered Puffbird and then a close perched Green Hermit. Beside a bright yellow flowering tree we watched Snowy-bellied and Violet-bellied Hummingbirds, Green Thorntail, a Tropical Gnatcatcher, Hepatic Tanager and nearby just two of us got good views of Yellow-green Tyrannulet. Leaving this area we travelled even higher to Cerro Jeffre where it was a little misty. Along the open track we soon found a pair of Stripe-cheeked Woodpeckers and amazingly a Lesser Nighthawk which was flushed from the roadside to reveal a tiny chick. The area was generally quiet but we did find Black-and-yellow, Black-striped, and Bay-headed Tanager. It was then time for lunch so we retreated to a private restaurant with fantastic views over the surrounding forest. Feeders here held plenty of Whiter-vented Plumleteers, Green Hermits and Rufous-tailed Hummingbirds. After lunch we set off on our drive to the Gamboa Lodge beside the Panama Canal. As we neared the lodge a roadside stop got us good views of a roosting Great Potoo. Not much further and we arrived at our fantastic lodge, the perfect base to explore some of Panama’s best birding areas such as the famous Pipeline Road. After settling in we met for a short walk along the entrance road. A good bunch of birds were soon found including Thick-billed Euphonias, Red-crowned Woodpecker, Violaceous Trogon, Red-lored Parrots, Cocoa Woodcreeper and a pair of Blue Dacnis. A lone Cecropia tree held a Three-toed Sloth, we found a female White-winged Becard on a nest and in a small patch of forest, there were Broad-billed Motmot, Tawny-crowned Greenlet, Southern Beardless Tyrannulet and Yellow-olive Flycatcher. As we made our way back a couple of Central American Agoutis ran around the open grass and a male White-winged Becard was now by its nest. A baby Yellow-green Vireo sat in a bush just a few feet off the ground and finally an Anhinga flew over. We enjoyed a fantastic evening meal this evening in the restaurant of our wonderful hotel. This morning we had an early breakfast before driving to the nearby Pipeline Road. Arriving here just before sunrise we set off on a walk along this famous yet very muddy road. A couple of Blue-crowned Motmots started the day off, shortly followed by White-faced Capuchins and a White-nosed Coati. Moving slowly along we picked off species one by one including Red-throated Ant-Tanager, Dot-winged Antwren, Grey-headed Tanager and a nice male Black-throated Trogon. Several Purple-throated Fruitcrows flew around the tree tops where they were joined by Scarlet-rumped Caciques and a Slaty-tailed Trogon. A Green Ibis flew over and on a small forest stream we saw two Grey-necked Woodrails run off. Several kilometres along this increasingly muddy road we added White vented Plumeleteer, Grey-headed Tanager, Golden-collared Manikins, Spotted Antbird, Red-capped Manikins and a very attractive pair of Cinnamon Woodpeckers. 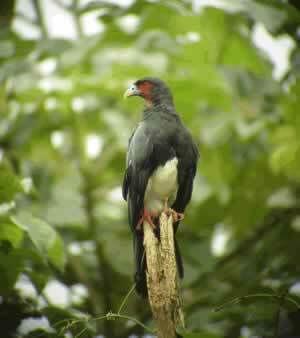 Beside a fruiting tree that held Masked Tityra we watched a group of Brown-headed Parrots and a White-tailed Trogon. Continuing our walk we managed to find a White-whiskered Puffbird and a pair of superb Spot-crowned Antvireos. Above us on a horizontal branch we got excellent views of a Double-toothed Kite and then a small river gave us great looks at a Pygmy Kingfisher. Moving on again we found a Brownish Twistwing and yet another species of puffbird with a close views of the first of four perched Black-breasted Puffbirds. Beside the track a confiding Bi-coloured Antbird showed well and a small flock included displaying White-flanked Antwrens, Brownish Twistwing and Fasciated Antshrike. On another small stream we saw a Green-and-black Poison-Dart Frog and our final birds of the morning included Blue-capped Manikin and Rufous Mourner. Returning to our hotel for lunch we had a little free time afterwards and some of the group walked to the ponds in the grounds and saw good numbers of dragonflies, a pair of Southern Lapwings, Wattled Jacanas, a very elusive Caiman and as we were about to leave a perched Grey Hawk. Aboard our coach we drove to some nearby ponds where after some thorough searching we found a variety of species that included Collared Aracari, Scrub Greenlet, Golden-crowned Greenlet, Fasciated Antshrike, Greenish Elaenia, Golden-hooded Tanager, Red-legged Honeycreeper, Grey-headed Chachalaca and Tawny-crowned Greenlet. From here we drove to another area of small lakes which turned out to be a good move as we soon spotted a Rufous-and-green Kingfisher, a superb Agami Heron and a difficult to see Boat-billed Heron. In an area of tall trees and bamboo we got to see a roosting Spectacled Owl, a very good ending to another bird-filled day. Our last day started with another early morning breakfast for most of the group while others opted to have an easier day and do their own thing around the lodge grounds. Those going into the forest today were met by a 4x4 which we soon climbed aboard and made our way slowly through a maze of muddy pools and gullies. 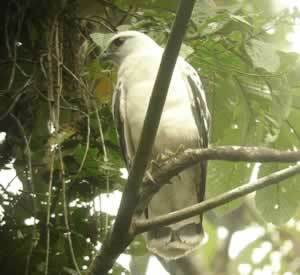 A Grey-headed Kite was heard calling so we stopped got out and found this bird sat in a tall tree. Continuing on we eventually got to an area so muddy the vehicle couldn’t get through. We decided it was time to get out and walk and as most of us were still climbing off the back, Kev was frantically waving us to join him on a ridge. By his gestures I had already guessed what he had seen, and as soon as we had all raced to his side he told us that just he and Nigel had seen a Rufous-vented Ground-Cuckoo run across the track right in front of them. The next few minutes were very tense as we quizzed them over how close it was and what sort of views they had got. We waited and waited to see if it would reappear but eventually I couldn’t wait any longer and set off quietly in the direction it was last seen. Three or four of the group followed until we heard a low “booming” coming from the bushes ahead. Unsure of what it was we tracked closer and closer but could not see anything. Thinking that this must be the Ground-Cuckoo calling we quietly got even closer and then suddenly it dropped out of a tree about 6ft from the ground, kicked up a load of leaves as it sprinted off along the forest floor and in about two seconds was gone. More frustration set in as I was the only one to witness this. Having seen how fast and how far it had run, it was assumed that it was probably another country by now! As we gathered everyone together and discussed what to do next, a distant “booming” could be heard. With hopes raised Kev led us towards the call and after five to ten minutes we were close but once again just Kev and me were the only ones to see it drop out of a tree again and dash off. Tracking the call again we got a good spot that allowed us pretty good views within the forest. After a short wait I saw this awesome bird bounce straight up into a small tree about 5ft up. Quiet panic ensued as we managed to get everyone on this mythical bird. It then dropped down and moved again but this time it reappeared in a closer and more open position where we could all once again get fabulous views. It stayed on view for ages and the sheer delight on all of our faces that we had seen one of the most sought after birds in Panama was truly evident. Can you believe we didn’t have a camera amongst us. Leaving this superb bird we went in search of other delights, although myself and Keith went back and relocated it immediately just 20ft away sat in the open up a tree - I thought it was supposed to be a “ground” cuckoo! Back on the track and we struggled to get views of a Green Shrike-Vireo high in the canopy, but easier and lower were Long-billed Gnatwren and Emerald Tanager. A small feeding flock produced excellent views of Grissom’s Antwren and Fulvous-vented Euphonia as well as Thick-billed Euphonia and White-shouldered Tanager. Still on a high from seeing the Ground-Cuckoo we returned jubilant to the hotel. After lunch we packed our luggage onto the coach and set off towards Panama City. A brief stop along the way found us a few species such as Ochre-bellied and Yellow-margined Flycatcher plus Rufous-breasted Wren before we continued our way to the airport and concluded a very tough but rewarding tour. I would like to thank everyone on this tour and congratulate our survival! Particular thanks must go to Kevin Easley who found us an amazing amount of the speciality birds.